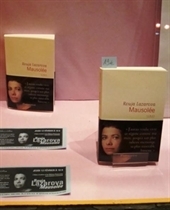 Rouja Lazarova's latest novel "Mausoleum" (in French: Mausolée) was published in Bulgarian. Rouja lives in Paris and writes in French. Her previous novels "At the Top of the Tongue", "Crossed Hearts" and "Brakes" got into the hearts of the French readers and made her very popular in France. Now she is introduced to the Bulgarian literary market with the translation of "Mausoleum" , the story of three women in the period 1944-1989 and the after-marks of communism.